Having the best of both worlds—that was the goal for building the 2016 KTM 690 Adventure and it started with a new KTM 690 Duke. It’s much lighter and has a lot more power than the other 650s in its class. 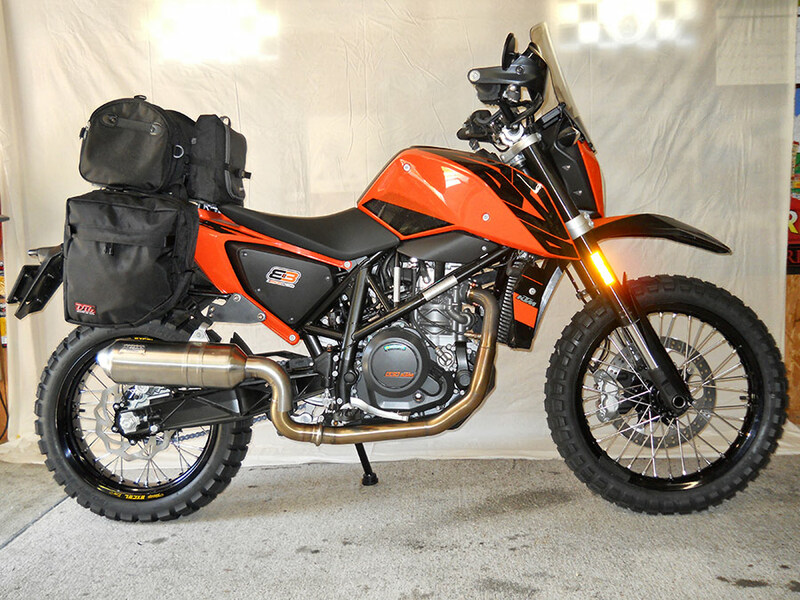 Of course you could buy a 2016 KTM 690 Enduro, but the Enduro is just not as friendly at freeway speeds. Footpeg and handlebar vibration are annoying on the highway, and it has a much taller seat. The 2016 KTM 690 Duke feels smooth—much better than everything else in the 650cc to 700cc single cylinder family. The only drawback is the 690 Duke’s inability to handle dirt, which can be remedied by the addition of a 19-inch front wheel for more dirt pattern tire choices—not to tackle the sands of Dakar or scale the peaks of Colorado on rocky jeep roads, but to enjoy some exploring the secondary graded dirt roads you won’t have to bypass. With these modifications, the 690 Adventure Duke becomes more usable as a sport bike that’s somewhat dirt-road capable, but is still top of its class on a twisty section of hardtop. Kind of like an “Austrian Army Knife,” a real hooligan with hiking boots and a backpack ready to go just about anywhere. The change to the 19-inch from a 17-inch wheel will not have any noticeable effect on turn-in or steering effort as the Adventure Duke carves the canyons just as well with either size front. It does, however, change the ride height slightly. 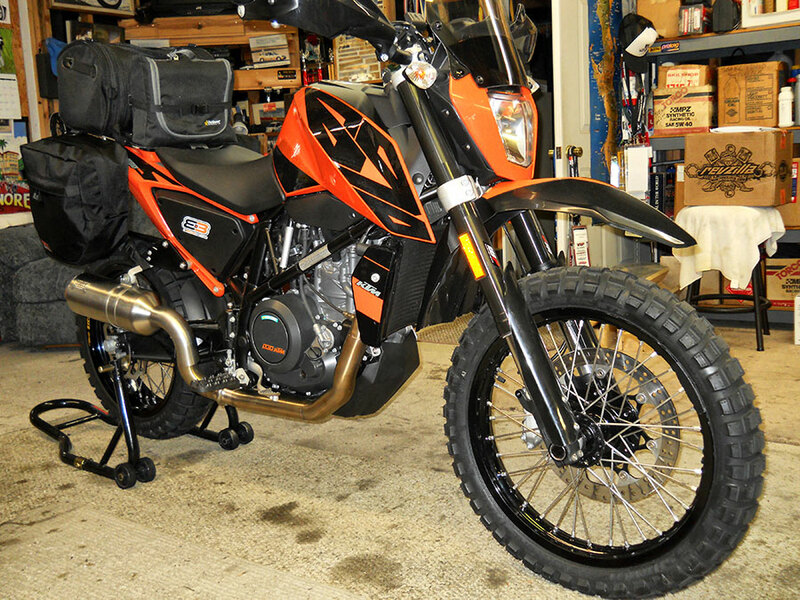 The KTM 690 Enduro front hub goes right on the 690 Duke. The front axle fits but you’ll have to machine spacers to align the Enduro hub to the Duke fork width. Use an Excel 2.15 x 19 black rim and Dubya 19-inch spokes. 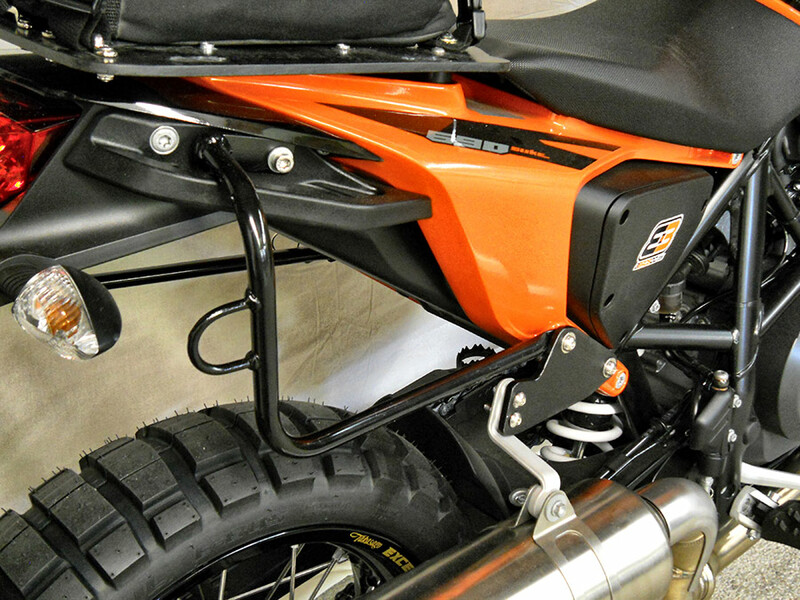 Move the front fender up by replacing the stock one with the 2008 KTM SMR high fender. To do this, fabricate an aluminum plate to attach the fender and mount the plate to the two studs coming out of the lower fork clamp that holds the headlight at a right angle. Use an 8mm bolt through a handlebar-end hand-guard expansion sleeve, and insert it into the center hole of the fork clamp T-stem. The expansion sleeve just fits up into the tee stem hole and holds the aluminum fender bracket in place in a three-point mount. The brake caliper from the 690 Duke aligns with the 690 Enduro 320mm disc. Use the Duke front brake disc size of 320mm with the 690 Enduro hub bolt pattern. Galfer makes a 320mm front brake disc for the KTM 690 Enduro front hub. Get the ABS sensor from the 690 Enduro (the 690 Duke disc and sensor will not fit the 690 Enduro spoke wheel front hub due to a different brake rotor mount bolt pattern). Mount the tire of your choice. There are many 19-inch front tire choices that work well on pavement and dirt. The tire choice will affect traction, so don’t play racer on the pavement with an adventure tread front without feeling the traction limits first. The Shinko Adventure Trail E804 works well on both dirt and street. Much better than the squirmy feel of the OEM 21-inch fronts found on most adventure bikes. For more of an adventure bike look and some hand protection on cold days, add the KTM 1190 Adventure handguards. The bar end mirrors from Rocky Mountain ATV/MC attach to the handguards with a couple of short spacers and some 8mm button head cap screws. The handlebars are from Rocky Mountain ATV/MC—Tusk FatBars in black with an ATV high bend. The GPS AMP Rugged Mount for the Garmin Montana 600 goes on a 1-inch ball stud at the handlebar clamp. The 12v power for the GPS is from the Duke OEM wire harness behind the headlight mask. A 12v red and black female connector is wired into the harness for grip warmers or a 12v outlet. It works off the ignition key, so the GPS only works on bike voltage when the key is on. Add a 1-inch ABS plastic spacer with an 8mm countersunk head bolt to the bottom of the OEM side stand. Make the side stand’s pad diameter about two inches for better stability when parking on a dirt surface. Attach the new extension to the base of the side stand by tapping an 8mm hole for the counter sunk bolt. The footpegs are from IMS—they’re longer and with teeth to hold your feet in place. The new Rally Pegs from a Kawasaki KLR 650 bolt right on and use 8mm through bolts in place of the OEM pins. The windshield is from a Kawasaki KLR650. It’s two inches higher and offered as an accessory from Kawasaki. Just trim about two inches off the bottom where the black is and add a couple of mount tabs riveted to the OEM Duke headlight mask. Luggage for a day trip or a longer journey includes a tail bag from Saddlemen, and DirtBagz side bags from DBZ Products. The DirtBagz are the “Scout” model size and hold enough for a week’s trip if you pack light. The Dirtbagz include custom-built attachment mounting rails that bolt right on. Special note: If you feel that spoking up wheels is a little beyond your skill level, take your wheel components to a shop with wheel building experience. The extra cost is sometimes worth it. Use 17-inch rear spokes from Dubya with an Excel 4.25 x 17 black rim. Make sure to keep the same offset from the Duke cast wheel when spoking up the 690 Enduro hub to the 4.25 Excel rim. 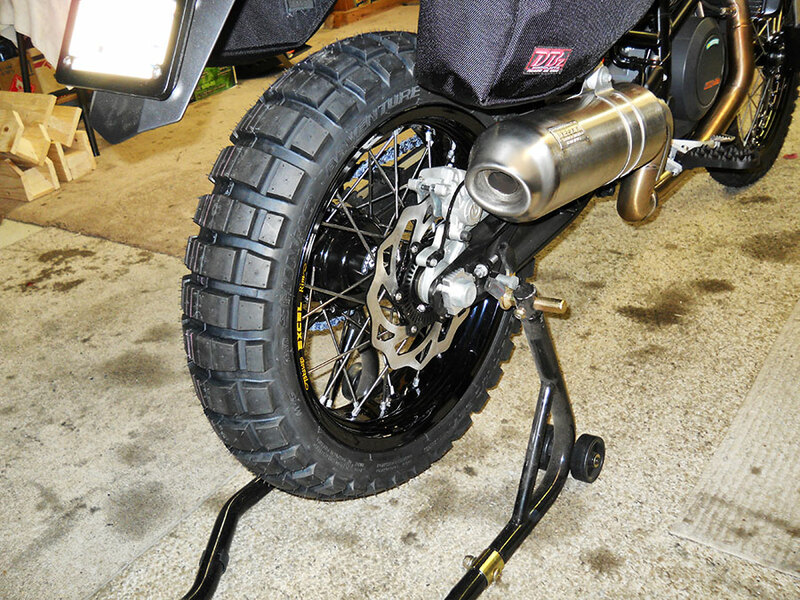 You will have to use the 690 Enduro rear disc. 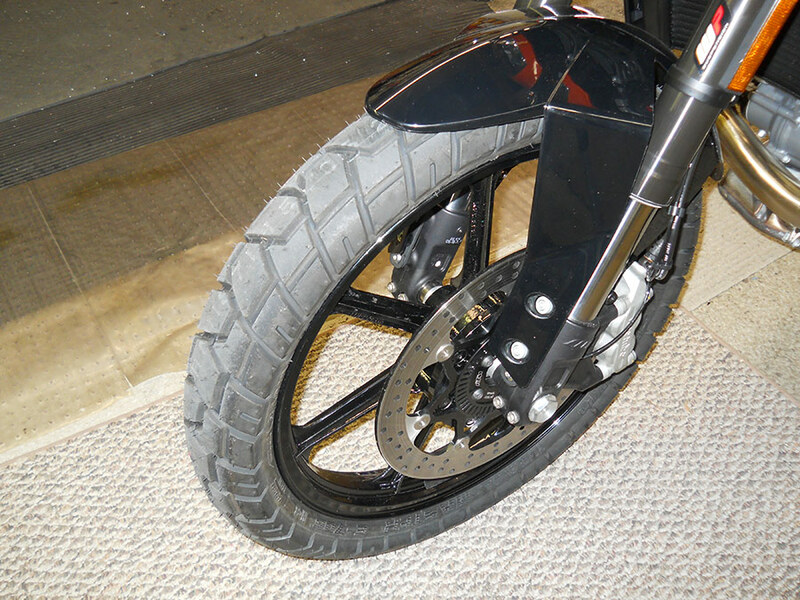 The Duke rear disc is the same diameter, but a different bolt pattern. The rear hub is a cush drive from a KTM 690 Enduro. The 40T rear sprocket from the Duke is interchangeable. Rear tire choice is the same as the front. A 130/80-17 Shinko Adventure Trail E805 from Rocky Mountain works as well on the pavement as it does on graded dirt roads. The skid plate “Under-Engine Protector” is from a KTM 690 Enduro. It keeps the rock chips from dulling the front of the engine and looks good. Attach with a couple of fabricated tabs to the front engine mount bolt and with a turned-up aluminum plate riveted to the rear of the ABS skid plate. The aluminum plate is bent so it slips over the rear cross brace between the frame rails and it makes removal easy to change the oil. To add the skid plate, you’ll have to remove the center muffler. Keeping the stock rear muffler in place will give a slightly louder note, but not too noisy. Or you can keep the stock OEM exhaust and center muffler in place. It just looks clunky with that big snow shovel shape under the engine. And the stock rear muffler location will interfere with the lower part of the right side DirtBagz. If you do remove the center muffler you’ll have to fabricate a pipe from the stock header below the oxygen sensor that attaches to the header pipe. This will require a good fabricator and TIG welder to make it look professional. Cruises at: 75–80 mph with very little vibration. Mirrors: Much easier to see out of.